Jiří Mucha, Alphonse Mucha: His Life and Art. London: Heinemann, 1966. Jiří Mucha, Alphonse Mucha: The Master of Art Nouveau. Prague: Knihtisk Artia, 1966. Jiří Mucha, Can-Can with a Halo: The Life and Work of Alphonse Mucha. Prague: Obelisk, 1969. Jiří Mucha, Marina Henderson and Aaron Scharf (eds.) Alphonse Mucha. London: Academy Editions, 1974. Graham Ovenden, Alphonse Mucha Photographs. London: Academy Editions, New York: St. Martin’s Press, 1974. Alphonse Maria Mucha, Lectures on Art: A Supplement to the Graphic Work of Alphonse Mucha. London: Academy Editions, New York: St. Martin’s Press, 1975. Gabriel Mourey, The Art Nouveau Style Book of Alphonse Mucha: All 72 Plates from Documents Décoratifs. New York: Dover Publications, 1980. Anna Dvořák, Mucha’s Figures Décoratives: 40 Plates by Alphonse Mucha. New York: Dover Publications, 1981. Alain Weill, Alphonse Mucha: All the Postcards. Uppsala, Sweden: Hjert & Hjert, 1983. Jack Rennert and Alain Weill, Alphonse Mucha: The Complete Posters and Panels. Uppsala, Sweden: Hjert & Hjert, 1984. Jiří Mucha, Alphonse Maria Mucha: His Life and Art, London: Academy Editions 1989. Ann Bridges (ed.) with Jiří Mucha, Marina Henderson, Anna Dvořák, Alphonse Mucha: The Complete Graphic Works. London: Academy Editions, 1991 (reprinted edition). Arthur Ellridge, Alphonse Mucha: The Triumph of Art Nouveau. Paris: Pierre Terrail Editions, 1992. Renate Ulmer, Alfons Mucha. Koln, London: Taschen, 1994. Marta Kadlečíková, Mucha Pastels. Prague: BB Art, 1996. Sarah Mucha (ed.) with Ronald F. Lipp, Victor Arwas, Anna Dvořák, Jan Mlčoch and Petr Wittlich, Alphonse Mucha. London: Mucha Limited, 2000. Sarah Mucha (ed. ), Alphonse Mucha: Celebrating the Creation of the Mucha Museum. Prague: Mucha Foundation in Association with Malcolm Saunders Publishing, 2000. O.B. Duane, The Life, Times and Work of the World’s Greatest Artists: Mucha. London: Brockhampton Press, 2003. Josef Moucha, Alfons Mucha: Foto Torst Vol.3. Prague: Torst, 2005. Brian Reade, Art Nouveau and Alphonse Mucha. London: Victoria & Albert Museum, 1963. Jiŕí Kotalík, Jana Brabcová, Jiŕí Mucha et al., The Spirit of Art Nouveau: Alphonse Mucha. Tokyo: Tokyo Shimbun/Doi Technical Photo, 1983. Jiŕí Kotalík, Jana Brabcová, Jiŕí Mucha, Norio Shimada et al., The 50th Year Anniversary Exhibition of Alphonse Mucha. Tokyo: Tokyo Shimbun/Doi Co. Ltd., 1989. John Hoole, Tomoko Sato (eds), with Victor Arwas, Alphonse Mucha. London: Lund Humphries/Barbican Art Gallery, 1993. Sarah Mucha (ed.) with Petr Wittlich, Alphonse Mucha: Pastels, Posters, Drawings and Photographs. London: Malcolm Saunders Publishing, 1994. Karel Srp (ed. ), Alphons Mucha: Das Slawische Epos. Krems: Kunsthalle, 1994. Norio Shimada, Petr Wittlich (eds), Alphonse Mucha: His Life and Art. Tokyo: The Tokyo Shimbun, 1995-97. Petr Wittlich, Alphonse Mucha and the Spirit of Art Nouveau. Lisbon, Calouste Gulbenkian Museum, 1997. Victor Arwas, Jana Brabcová-Orlíková, Anna Dvořák (eds), Alphonse Mucha: The Spirit of Art Nouveau. Alexandria, Virginia: Art Services International, 1998. Anna Dvořák, Helen Bieri Thomson, Bernadette de Boysson, Alphonse Mucha – Paris 1900: Le Pater. Prague: Obecní dům, 2001. Milan Hlavačka, Jana Orlíková, Petr Štembera, Alphonse Mucha – Paris 1900: The Pavilion of Bosnia and Herzegovina at the World Exhibition. Prague: Obecní dům, 2002. Nobuyuki Senzoku (ed. ), Alphonse Mucha: Treasures from the Mucha Foundation. Tokyo: Nippon Television Network Corporation, 2004. 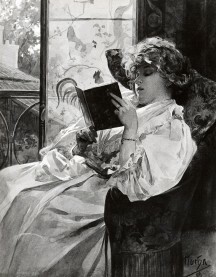 Nobuyuki Senzoku, Marta Sylvestrová, Petr Štembera (eds), Alphonse Mucha: The Czech Master of Belle Epoque. Tokyo: NHK Promotions Co., Ltd, 2006-2007. Àlex Mitrani (ed. ), Alphonse Mucha 1860-1939: Seducción, Modernidad, Utopía. Barcelona: Fundación “la Caixa”, 2008. Jean Louis Gaillemin, Christiane Lange, Michel Hilaire, Agnes Husslein-Arco (eds), Alphonse Mucha. Munich, Berlin, London, New York: Prestel, 2009-2010. Marta Sylvestrová, Petr Štembera, Alfons Mucha: Czech Master of the Belle Epoque.Brno, Moravian Gallery/Budapest, Museum of Fine Arts, 2009-2010. Tomoko Sato with Jeremy Howard, Alphonse Mucha: Modernist and Visionary. Aosta, Italy: Forte di Bard, 2010. Robert Melville, ‘Le Style Mucha is Fashion’ in The Ambassador, London, 1963, pp. 89-93. Jiří Mucha, ‘The World of Mucha’ in London Magazine, August, 1963, pp. 43-52. Faith C. Knutson, ‘Painting by Alfons Mucha Graces Pisek, North Dakota, Church.’ Pisek, North Dakota: St. John’s Guild of Pisek, 1979. Sam Staggs, ‘Jiří Mucha: Fathers and Sons’ in Art News, 1989, vol. 88, no. 5, May, pp. 83-86. Julian Freeman, ‘Alphonse Mucha, Barbican Art Gallery’, in Apollo, 1993, vol. 138, no. 380, October, pp. 255-256. Thomas Tuohy, ‘Alphonse Mucha in Prague’ in Apollo, 1994, vol. 140, no. 390, August, pp. 72-73. Richard Handler, Jocelyn Linnekin, ‘Tradition: Genuine or Spurious?’ in Journal of American Folklore, vol. 97, no. 385, pp. 273-290. F. Šubert, ‘Essay to the Paintings of the Painter Bohumir Lindauer Discovered at Valašske Klobouky and Vizovice in Moravia in Czechoslovakia,’ Unpublished Manuscript, Prague, 1961. Courtesy of the Auckland City Art Gallery Library, New Zealand. Anna M. Dvořák, ’Alphonse Mucha: Book Illustrations and Mural Paintings,’ Doctoral Thesis, University of North Carolina at Chapel Hill, 1978. Stephan Tschudi-Madsen, Sources of Art Nouveau. Cambridge, MA: Da Capo Press, 1956. A.G. Lehmann, The Symbolist Aesthetic in France. Oxford: Basil Blackwell, 1968. Jane Abdy, The French Poster. London: Studio Vista, 1969. John Dixon Hunt, The Pre-Raphaelite Imagination 1848-1900. London: Routledge & Kegan Paul, 1969 (second edition). Philippe Jullian, Dreamers of Decadence: Symbolist Painters of the 1890s. London: Pall Mall Press, 1971. Edward Lucie-Smith, Symbolist Art. London: Thames and Hudson, 1972. Philippe Jullian, Alan Bowness, Geneviève Lacambre et al., French Symbolist Painters: Moreau, Puvis de Chavannes, Redon and their followers, Arts Council of Great Britain, 1972. Philippe Jullian, The Symbolists. London: Phaidon, 1973. Philippe Jullian, The Triumph of Art Nouveau: Paris Exhibition 1900. London: Phaidon, 1974. Petr Wittlich, Art Nouveau Drawings. London: Octopus Books, 1974. Geneviève Lacambre, Hans H. Hofstätter, Franco Russoli, et al., Le Symbolisme En Europe. Brussels: Musées Royaux des Beaux-Arts de Belgique, 1976. Robert Pincus-Witten, Occult Symbolism in France. New York and London: Garland, 1976. Jean C. Cooper, An Illustrated Encyclopaedia of Traditional Symbols. London: Thames and Hudson, 1978. Robert L. Delevoy, Symbolists and Symbolism. Geneva: Skira, 1978. Georges Herscher, L’art et les biscuits: La publicité de la firme Lefèvre-Utile de 1897 à 1914. Paris: Editions du Chêne, 1978. Robert Schmutzler, Art Nouveau. London: Thames and Hudson, 1978. John Barnicoat, A Concise History of Posters. London: Thames and Hudson, 1979 (First edition 1072). Robert Goldwater, Symbolism. London: Allen Lane, 1979. Maly Gerhardus, Symbolism and Art Nouveau: A Sense of Impending Crisis, Refinement of Sensibility and Life Reborn in Beauty. Oxford: Phaidon, 1979. Nikolaus Pevsner, The Sources of Modern Architecture and Design, London: Thames and Hudson, 1979 (first edition 1968). Siegfried Wichmann, Japonisme: The Japanese influence on Western art since 1858. London: Thames and Hudson, 1981. Lara-Vinca Masini, Art Nouveau. London: Thames and Hudson, 1984. Jack Rennert (ed. ), Timeless Images: Development of Poster Art Around the World 1820-1936. Tokyo: The Mainichi Newspapers, 1984. Gabriel P. Weisberg (ed. ), Art Nouveau Bing: Paris Style 1900. New York: Abrams, 1986. Geneviève Lacambre (ed. ), Le Japonisme, Paris: Musée d’Orsay, 1988. Debora L. Silverman, Art Nouveau in Fin-de-Siécle France: Politics, Psychology and Style. Berkeley: University of California Press, 1989. Carl G. Liungman, Dictionary of Symbols. New York, London: W. W. Norton and Company, 1991. Hans Biedermann, Dictionary of Symbolism: Cultural Icons and the Meanings Behind Them. New York: Facts on File, 1992. Janet McKenzie, Michael Spens (eds. ), with Lionel Lambourne and Stephen Calloway, ‘High Art and Low Life: The Studio and the fin de siècle’, Studio International Special Centenary Number Vol. 201, Number 1022/1023, 1993. London, Victoria and Albert Museum/Washington DC, The Arthur M. Sackler Foundation, 1993. Jeremy Howard, Art Nouveau: International and National Styles in Europe. Manchester, New York: Manchester University Press, 1996. Lionel Lambourne, The Aesthetic Movement. London: Phaidon, 1996. Gabriele Fahr-Becker, Art Nouveau. Köln: Konemann, 1997. Brian Petrie (ed. ), Puvis de Chavannes. Hants, Vermont: Ashgate, 1997. Damjan Prelovšek, Jože Plečnik 1872-1957. New Haven, London: Yale University Press, 1997. Paul Greenhalgh (ed. ), Art Nouveau 1890-1914. London: V&A Publications, 2000. Stephen Escritt, Art Nouveau. London: Phaidon, 2000. Tomoko Sato, Lionel Lambourne (eds. ), The Wilde Years: Oscar Wilde & The Art of His Time. London: Philip Wilson, 2000. Victor Arwas, Art Nouveau: The French Aesthetic, London: Papadakis Publisher, 2002. Hardy S. George (ed. ), Paris 1900. Oklahoma City Museum of Art, 2007. Joseph S. Rouček (ed. ), The Slavonic Encyclopedia. Toronto: George J. McLeod, 1949. Francis Dvornik, The Slavs: Their Early History and Civilisation. Boston: American Academy of Arts and Sciences, 1956. Francis Dvornik, The Slavs in European History and Civilisation. New Brunswick, New Jersey: Rutgers University Press, 1962. Miroslav Rechcigl (ed. ), The Czechoslovak Contribution to World Culture. The Hague: Mouton, 1964. Ivan Božić, Sima Ćirković, Milorad Ekmečić, Vladimir Dedijer (eds), The History of Yugoslavia. Belgrade: Prosveta, 1973. A.H. Hermann, A History of the Czechs. London: Penguin Books, 1975. Anna Masaryková, ‘Czechoslovakia: The Secession in Eastern Europe’ in Frank Russell (ed), Art Nouveau Architecture. London: Academy Editions, 1979. pp. 218-28. Ronald Sussex, J.C. Eade (eds. ), Culture and Nationalism in Nineteenth-Century Eastern Europe. Columbus, Ohio, USA: Slavica Publishers Inc., Humanities Research Centre: Australian National University, 1985. Norman Stone, Eduard Strouhal (eds. ), Czechoslovakia: Crossroads and Crises 1918-1988. London: MacMillan Press, 1989. Benedict Anderson, Imagined Communities: Reflections on the Origin and Spread of Nationalism. London, New York: Verso, 1991. Petr Wittlich, Prague: Fin De Siècle. Paris: Flammarion, 1992. Eric Hobsbawm, Terence Ranger (eds. ), The Invention of Tradition. Cambridge: Cambridge University Press, 1993. Rostislav Svacha, The Architecture of New Prague 1895-1945. Cambridge, MA: MIT Press, 1995. Zdenek Lukeš, Damjan Prelovšek, Tomas Valena (eds. ), Josip Plečnik: An Architect of Prague Castle. Prague: Prague Castle Administration, 1996. Derek Sayer, The Coasts of Bohemia: A Czech History. New Jersey: Princeton University Press, 1998. Judith Ryan, Alfred Thomas (eds. ), Cultures of Forgery: Making Nations, Making Selves. New York, London: Routledge, 2003. Vladimír Birgus and Jan Mlčoch, Czech Photography of the 20th Century. Prague: Kant, 2010. Dorothy Kosinski, The Artist and the Camera: Degas to Picasso. New Haven, London: Dallas Museum of Art/Yale University Press, 1999-2000. Carol Ockman, Kenneth E. Silver (eds. ), Sarah Bernhardt: The Art of High Drama. New Haven, London: The Jewish Museum, New York/Yale University Press, 2005. Howard Greenberg, Annette & Rudolf Kicken (eds), Czech Vision: Avant-Garde Photography in Czechoslovakia. Ostfildern: Galerie Kicken, Berlin/Howard Greenberg Gallery, New York/Hatje Cantz, Germany, 2007. Bodo von Dewitz (ed. ), La Bohème: The Staging of Artists as Bohemians in 19th and 20th Century Photography. Museum Ludwig Köln/ Steidl Göttingen, 2010.